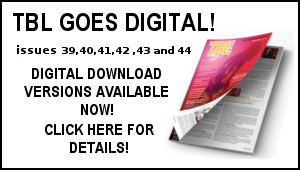 Or you can subscribe for all three 2011 TBL magazines for which you will immediately receive issues 29 and 30 with TBL 31 to follow. 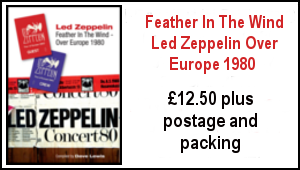 Tangible, collectable, re-readable and guaranteed to take you back to the music with fresh perspective. invaluable input in this issue from Mike Tremaglio, Richard Grubb, Ian Dixon,Michaela Firth, John Parkin,Michael Sherlock, Alessandro Borri,Edward Langohr, Lee Pritchard,Stephen Humphries, Rikky Rooksby, and Gerard Sparaco. It’s a good feeling that there’s some fresh new TBL product out there. Next few weeks will see initial planning underway on the Knebworth book second edition revamp which I am aiming for publication early in 2012 –plus work on TBL 31 for which there’s some great stuff lined up and various other bits. 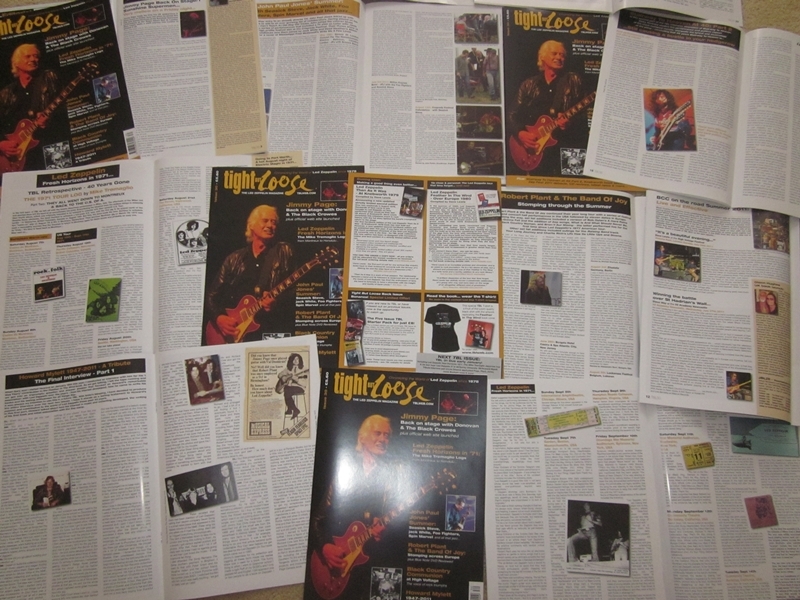 There’s been a good response to the limited edition TBL Back issue Bonanza pack. If you are new to TBL this is a great way to wade through the TBL archive. For one night only, on Tuesday November 1st at 7:30pm, participating Vue Cinemas will screen Black Country Communion’s debut concert film “Live OverEurope” in high definition and Dolby 5.1 Surround Sound. “LiveOver Europe” was filmed using 14 HD cameras duringBCC’s first ever world tour in the summer of 2011. Recorded across three nights in Hamburg, Munich and Berlin, the band’sset includes 18 songs taken from both of BCC’s albums; 2010’s eponymous debut,and 2011’s follow-up album release “2”. This one-night-only rock and roll cinema experience includes an exclusive filmed introduction from all four members of Black CountryCommunion. By pre–booking tickets via www.myvue.com/bcc fans who attend each of the 16 participating cinemas, will be automatically entered into a prize draw to win a guitar signed by the band. The participating Vue Cinemas are as follows –-London West End-Cambridge-Oxford-Portsmouth-Exeter-Bristol-Doncaster-Leicester-Hull-Leeds-York-Birmingham-Edinburgh-Dublin-Bury,Swansea. Sounds like a good night out in front of Glenn, Jason and co.
Inspirations here in the last few days-Sunday’s Match Of The Day 2 programme that opened with a summary sequece to the soundtrack of Whole Lotta Love, Spurs splendid 4-0 drubbing of Liverpool, you tube clips of the 02 rehearsal tape that has surfaced, and the daily dose of Jimmy Page’s web site diary – this week’s highlights have been the brilliant clip of Telecaster b –bending brilliance of Prelude from the Albert Hall ARMs show (this was the good lady’s first live viewing of the Led Zep guitarist – we had just got engaged to be married and this was a little treat!) Also loved his piece today on John Mayall’s I’m Your Witchdoctor. I tracked down a copy of that single on the Immediate label in 1973 and it cost me around £3 which was a lot for a single back then. I am going to search that one out and give it a blast later– as I have now got fully vinyled up again with a new turntable. Terry came round to set it up (not that it took much Terry!) as his one is already on the go. This was after our little celebration of Marc Bolan last Friday where inevitably one or to beers were drunk. Vinyl that has been played this week includes The Faces Ooh La La, Who’s Next, Led Zeppelin The Missing BBC Tracks bootleg, Rolling Stones More Exile On Main Street bootleg and Led Zeppelin Presence. You can’t beat it for full on clarity and resonance and of course a few clicks and pops along the way. Real music – real sound. later of their Song Remains movie and film soundtrack. Even when they got back on the road in 1977 only two of the seven tracks were performed live namely Achilles and Nobody’s Fault. 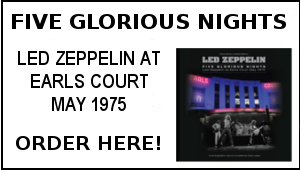 Jimmy Page still rates it highly .”All our pent up energy and passion went it to making it what it was”. For me personally the Presence album is, and always will be tangibly associated with my own circumastances of the time. 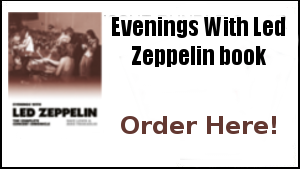 Playing out my own soap opera as an impressionabale 19 year old caught up in my first love affair all played out against the soundtrack of the new Led Zeppelin album, hanging on it’s every word and sound. And no more impressive words and sounds than those conjured up by Achilles Last Stand. Reading the title as it was mentioned in the pre release interviews,well…you just knew it was going to be an epic. And it was…still is. Even divorced from my own vivid memories of that spring of 1976, Achilles Last Stand still sounds like the most regal moment of their entire studio output. The thing about Presence is that it was the product of adversity. On the run from the UK tax system, Plant injured in a car accident, tour cancelled – all energies quickly funnelled into making an album as quickly as possible. For the often fragile at the time Page this adversity spurred on a surge of creative drive. Perhaps it was an act of defiance and protection.-their whole existence was now in question. Plant’s crash had rendered them unable to perform live -something they had always taken for granted. Page suddenly became the absolute leader again. It was the point where he must have realised that above all the craziness that surrounded them ,.it was the band, the music and their abilty to perform together that was the whole reason for being in Led Zeppelin. For him inventing Led Zeppelin in the first place. That realisation seem to ignite Page’s creative muse and motivation to the extent that he wanted this album to be completed quicker than anything they had recorded since their debut. His reaction was to take a firm grip of the three week recording sessions in Munich -leading them in much the way he did the first album. Many of the arrangements occured in the studio as they were recording. When the studio time ran over by two days he wrapped it all up with a massive fourteen hour overdub session. This urgency and spontaneity made little time for the experimentation of the past. So there were no boogie’s with Stu, no hat’s off to Harper’s. No funk or reggae parodies .No melletrons or synths. 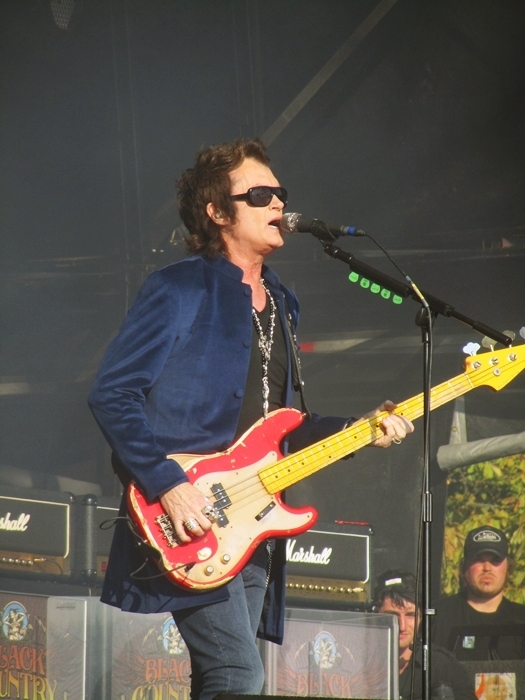 The result of the basic drums/bass/guitar /vocal approach was to give the record a very live feel – leading to the conclusion that in my view Presence is the nearest they got to capturing over a complete album the unpredictable edge and power of their on stage performances within a studio environment. So how does it sound 35 years on? Still intensely powerful. Still very focused. Achilles retains all the majesty and mystery that first so transfixed us way back then.. For Your Life has an undeniably dark edge as it grinds through its six minute duration. The Page solo here is simply one of his very best- perhaps THE best unfolding with incredible venom. The fact that all those years later in 2007, this was the only previously never performed live track they brought into the 02 set says everything about the esteem they themselves hold For Your Life in. Royal Orleans is the lighter touch punctuated by Page, Jones and Bonham pounding out the riff over which Plant unfolds the story of road fever at the hotel in the quarter. Oh and check out Bonzo’s intrinsic conga drumming half way through. In fact, check out John Bonham’s percussive command throughout the album-it’s impossible not to because he is in there on top of his game, driving every riff, nuance and idea with a Ludwig stamp of approval. Over on Side 2: for all their early blues musings on the first two albums, they never dressed up an old blues tune more inventively than when they’re wrote Blind Willie’s Nobody’s Fault But Mine. Lemon squeezing delta dealings merge with Page’s sonic technology. The phased guitar intro may be the best intro on a Zep track anywhere. In the Ral Donner skit Candy Store Rock we find them just turning themselves on playing on a 50’s groove in the manner they approached the countless off the cuff juke box faves within the Whole Lotta Love live medleys. The pure intuitive swing of Hots On For Nowhere reflects its live in the studio construction and as Charles Shaar Murray so astutely noted in his NME review brings to mind ”what Glen Miller would have sounded like had he played in a murderously heavy four piece rock band’. Leaving the understandably downbeat but beautifully textured Tea For One . A drifting slow blues reflecting Plant’s hurt at being away from his family .”Time goes very slowly when you can’t kick a ball…kick a roadie…even kick your drummer…. so time has been the teacher and I’ve been the pupil” he reflected at the time. Presence was Led Zeppelin’s lesson in immortality. Back in the autumn of 1975 years ago they found themselves in a position of for them, rare vulnerability and out if it made a record that once again saw the original catalyst of the group back at the helm. Presence is stock full of Jimmy Pages’s guitar rages. Rarely before or for that matter since has he dominated an album so convincingly. For that reason alone this album is a vital part of the story. 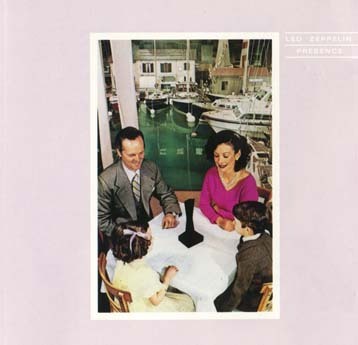 It will never enjoy the high profile of say the fourth album or Physical Graffiti but 35 years on, Presence still portrays the real heart and soul of Led Zeppelin more vividly than anything else they released. Copyright Tight But Loose Publishing 2011. Not to be reproduced without permission. Very good read once again ,how do you do it ?the Howard piece was a very moving read cant wait for the next instalment. LOOKING FORWARD TO READING THE PIECE ON HOWARD AS WELL AS ALL THE OTHER ZEP FILLED NEWS. Dave I think it’s so interesting how Zeppelin’s music has very different meaning for each of us. Jimmy’s riffs, Robert’s voice and the best damn rhythm section in rock music, tug at our souls note by note. These records mark time in our life, for you its Presence and the astounding Achilles. For me it was the first time I heard Whole Lotta of Love. Led II & IV along with Kashmir define significant times in my life. When Presence was released, I loved For Your Life and Robert’s voice on Nobody’s Fault But Mine; but it felt like an angry album, full of angst, demons and tragedy reflected after a horrible car accident. There is no beautiful acoustic piece to rest my weary head on; that year was full of strife for me which is personified on that record. Kashmir will always be the piece of music that reflects their most brilliant moment for me. The first time I heard “Achilles”, what struck me was not only the power, but the desperation. Page’s guitar tone was almost crying, and the “Ah-ah-AH” refrain sounded so exotic at the time. Still does. Of course, the rest of the album is great, and I agree with Dave that Page’s lead on “For Your Life” is brilliant. But all the solos on that album are brilliant. Each solo is so unique and has its own character. Still, it’s hard to think of “Presence” and not bring up “Achilles Last Stand”. With all due respect to “Kashmir”, “Achilles” is their finest moment. Looking forward to settling down with TbL30 as these autumn nights are drawing in, thanks for your efforts as always! Steve – get yerself a Clearaudio (I’ve got an Ambient), a new Linn is bonkers money! Steve -the vinyl player is an ion profile nowt fancy but sounds cool – I’d love a Linn mind you! Ed – what great Presence memories! Presence for me reminds me of a weathered old 8-track in pink plastic casing, which went everywhere we did in the Bicentennial summer of 76. Living near Andrews AFB outside of Washington DC, I can still recall hearing the initial sounds of “Nobody’s Fault” on the radio (98 Rock out of Baltimore), and the thought occuring to me that perhaps I was hearing the sonic boom of a F-18 taking off before I realized it was Page taking off. To this day, even young children catch on quickly to the infectious “La, la, la’s” of “Hot’s On”, and as you mentioned, the Glen Miller swing of that tune. Lastly, you mentioned the regal tone of “Achilles”, but I’ve always reserved the term for “Tea for One”, because to me, it is truly “regal” blues, as only the Brits can seem to pull off. I continue to be spellbound by the delicate grace and depth of emotion of Page’s fluttering solo on that tune, and it remains for me, one of his finest in his sterling canon. For me, when I revisit this record, time stands still. Prescence — I totally agree. Hi Dave pleasure to read as ever. I hope to resubscribe very soon. All the best to you and your family.